/ 10th Annual Campus Sustainability Day Fair! Join us for the 10th annual celebration of all things sustainable at UofL and in our community! 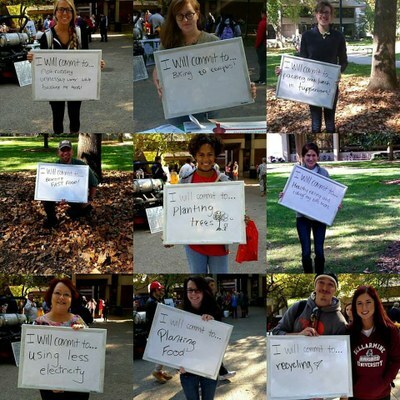 Learn what campus and community groups are doing to create a sustainable revolution. Sign-up to get involved and leave with some green freebies, great information, and a smile on your face! Take the Cards Go Green Pledge and earn an ethically-sourced reusable mug that you can fill with Fair Trade, shade-grown coffee provided by UofL Dining, award-winning tap water from the Louisville Water Company, or a bike blender smoothie from the Office of Health Promotion! The Honors Student Council will be collecting books, CDs, DVDs, Blu-Rays, vinyl records, video games, board games, and any other media for their 2018 Book and Media Sale (BAMS) with full proceeds benefiting Americana Community Center. The Volunteer In Jamaica Opportunity Network (VIJON) will be collecting used sports equipment (especially soccer, tennis and basketball) to give to kids in Jamaica at their sports camps. UofL Environmental Health & Safety will be collecting all kinds of batteries for recycling, including: Alkaline (A, AA, AAA, C, D, 9-volt); Button-cell; Lithium; Nickel-cadmium (Ni-Cad); Nickel metal hydride (Ni-MH); Lead and Lead-acid; Carbon-zinc; and Mercury batteries. If you'd like to host a sustainability-related booth or activity at the Campus Sustainability Day fair, please contact UofL Sustainability Coordinator, Justin Mog.